As a medical professional, you want a workable, cost-effective way to treat your patients who are suffering from anxiety, depression, and insomnia. Now you can even become a distributor of the best unit on the market that administers proven CES (Cranial Electrotherapy Stimulation) therapy to help your patients relax, feel better, and sleep better. The CES Ultra is by far the most cost-effective CES machine on the market, and you have confidence in its guarantee. After using it, most of your patients with anxiety, depression, and insomnia will experience improvement in their mood, sleep, and outlook on life – without any of the negative side effects of drugs. After you have provided the written order, you can either have your patients contact us directly to order for personal use and let us take care of all the details, or if you are a CES Ultra distributor, you can provide the device to your patients directly. We continuously seek to expand our base of healthcare professionals who employ CES. 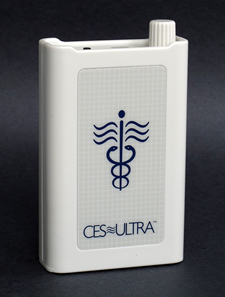 The CES Ultra is not usually covered by most medical insurance carriers and plans. Contact us today learn how to incorporate the CES Ultra into your practice and help your patients relax and find restful sleep and peace of mind. ​I have professionally worked with CES for twenty years and found it to be a very effective tool for the treatment of depression, anxiety, and insomnia. I also found it to have profound implications in addressing chronic pain, head injuries and PTSD. In a study on ADHD which I personally conducted, CES reduced both state and trait anxiety significantly and enhanced cognitive capabilities, gains which lasted six months after treatment. CES is very safe and has none of the negative side effects of some psychopharmacological interventions. It should be part of every mental health professionals’ treatment protocol.